SCENE: Man and woman on beach. Man: We just met! You can’t hate me yet! critter eager to bite you. With luck, you’ll be feeling super before the bandages even come off! 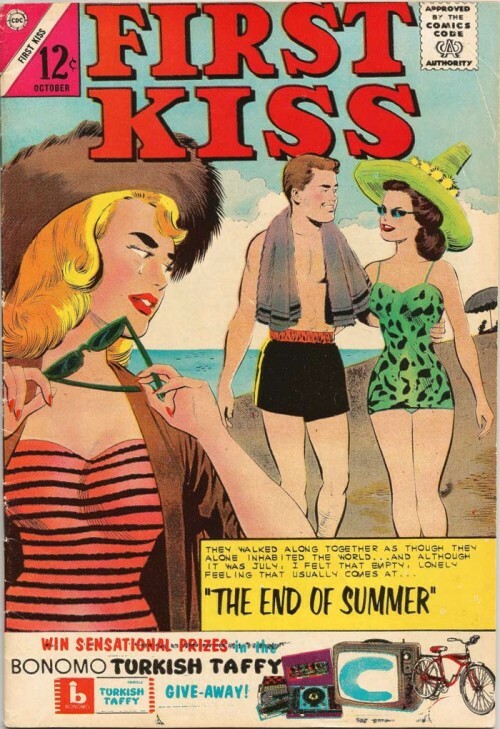 To save time—and especially money—Charlton Comics often used elements of the interior art for its covers. SCENE: Woman tearfully watches as her husband and her mom walk on the back with their arms around each other. 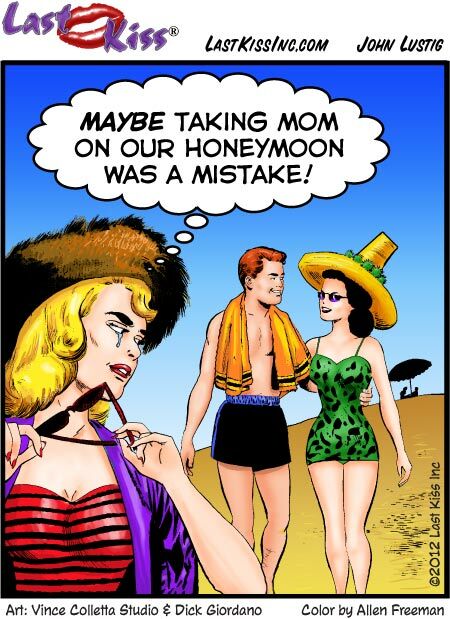 WOMAN (thinking): Maybe taking mom on our honeymoon was a mistake! On sale today–through eternity! Stock up now and save!! SCENE: In the background, a vendor on the beach is selling something that looks like popsicles. In the foreground, a man and woman (both wearing bathing suites) look at the vendor and talk. MAN (next to her): Oh, boy! I want mine with extra crude! CAPTION (below the comic): Oilsicles!® Made fresh from new oil that washes ashore every day! Hmm hmm good! By “completely safe” I mean, of course…that it’s safe if you don’t mind getting sick. Other minor side effects include death. Other than that, no problems. See my second comic about the BP oil disaster here! SCENE: A man and woman are on the beach, running barefoot towards the water. MAN: Yup! it’s natural sunblock! And completely safe...unless the ocean catches on fire! CAPTION/TAG LINE (below art): bp! Free sunblock forever…because we care! Hey, anyone who’s a parent is really a superhero, right? SCENE: A mom and dad at home with their young daughter. CAPTION: Dr. Hugo Mania and Prof. Mary Shrinkhead (AKA Major Ego and Captain Id) were as happy as two superheroes could be! But then they got married and soon they were facing their toughest challenge…raising a child! MAJOR EGO: Let’s take Suzy with us on our crime patrol! CAPTAIN ID: She can carry a laser cannon! We’ll call her Super Ego…the tiny tot of Freudian Justice! SUZY: But I want to go to the beach! SCENE: SCENE: Scene shifts to family in bathing suits at the beach. CAPTION: Holy Dr. Spock! What a dilemma! Pummeling criminals (until they admit their self-destructive tendencies) or spending "quality time" at the beach! What will they choose? CAPTAIN ID: Well…I suppose we can fight crime here instead! MAJOR EGO: Sure! Evil mutant surfers are bound to show up! SUZY: Lord! I just pray I was adopted!